A seat wall can add something very different to the every day patio design. It provides something vertical in what is otherwise a flat hardscape. In addition, different (but coordinating) wall materials can add even more interest. Aside from their looks, they are functional also as they provide extra seating. More places to sit is not only a nice thing to have, but since these hardscape features are typically located along the patio perimeter, they do not take up much space. At times these small landscape structures can also be located where they divide a space...such as a large patio into two separate areas. How to design this type of seating is not that difficult as long as you keep some dimensions in mind. 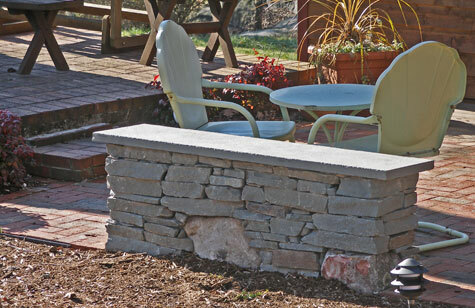 Here is a small patio seat wall made of beautiful stone. L- shaped seating area with piers. This 3D design shows a long seat wall with two right angles. Also notice the end column sizes in relationship to the wall itself. End columns should be designed larger (see below). If you would like to see more seatwall designs and how to add them to your patio, take a look at my ebook on patio plans with many of my professional designs. Stone wall with bluestone patio. Here is a an example with a bluestone cap which finishes it off nicely and is also comfortable to sit on. It's not a very long one and there are no ending columns. However, it is still successful! It works well as a casual sitting area, leaving lots of open patio area to access the backyard. These types of walls should be 18 to 24" high. I like to use the mid range of about 21" as I find this is the most comfortable. Segments should be at least four feet long. 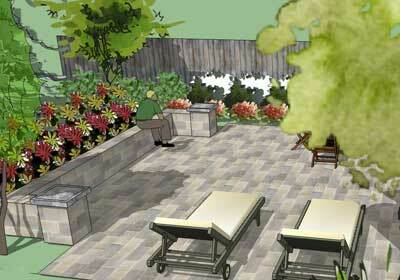 The length depends on the design of the patio, how the walls will fit, what will look best, and the seating required. However, very long lengths can get monotonous. They can be designed as a single length. However, if you create them in a corner where there are two segments at right angles, this is vewry comfortable for conversation. Imagine sitting with someone where chairs are positioned this way as opposed to them being in a straight line...much easier for chatting. If your patio is curvilinear, a wall along the curve is very eye catching. Sitting walls should be 12" to 18" wide. End the walls with piers (short columns) or boulders. The size of columns should be slightly larger than the seat wall itself. For example, if your seat wall is 12" wide, you can make the column 15" wide so that it will extend past the wall 1 1/2" on all sides. Columns should have an important and good looking cap on top. This can be made of bluestone, limestone or other materials. The wall cap should be larger than the column and nice and thick...2 - 3" in thickness looks great. The cap should also extend past the column itself. So, following the above example, if the column is 15" wide, the cap could be 19" wide, extending 2" past the column on all sides. The height of the end columns should be taller than the wall itself by at least 6", including the cap. Use this as a guide. The piers may have lights on top of them, urns with plants, or be left simple. Also, the walls can be planters. Leave a wide enough border/edging for sitting. This does necessitate the wall being much wider. As an example, place 12" wide bluestone along the top perimeter of the planter, allowing a minimum of 12" planter space in width. The structure would then be 36" wide. 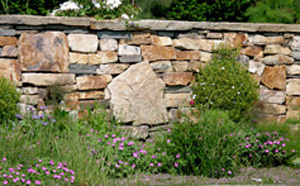 Keep in mind that these walls can be either free standing walls or landscape retaining walls. If you have a free standing wall, pricing will be more expensive as you will be charged for both sides of the wall! Do not forget about retaining wall drainage, whether your wall happens to retain soil on one side. Also, walls stop the flow of water so you must have a proper drainage plan. Often trench drains are used at the base of the wall, where water enters the drain and is then led elsewhere. What material you use for your walls depends on what you use for your patio. 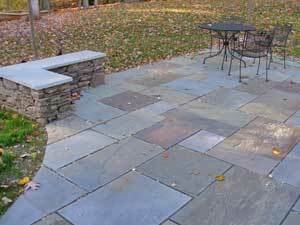 For a paver patio design, seat walls can be coordinating concrete block or stone. The cap can be block for block walls or even bluestone. Stone walls should have a bluestone or limestone cap. A brick patio design looks well with brick or stone seat walls with bluestone or limestone caps. Sitting walls for concrete patios can be almost anything. Concrete designs are usually not that busy, so stone, brick, or concrete block all will work. Just make sure the colors go well together. There are many types of stone to use as a material too. Click here to see actual patio plans that I did for some of my clients. Both 3D and plan view designs are shown so that you can use them or get ideas for your own project. Explanations are also provided. Lots of unique features are included (such as seatwalls), pergolas, multi-level patios, etc. Get help with your patio with my ebook!